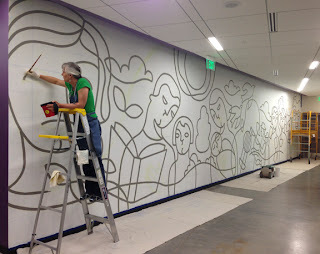 Last week I began painting color on the mural and wanted to share the progress with you. I started with the muted green color and painted all of those shapes in the design. Since the majority of the wall is still white I found it helpful to then paint all of the black shapes so I could see the darkest color as well. It is exciting to see it coming together! Working on an exciting project! 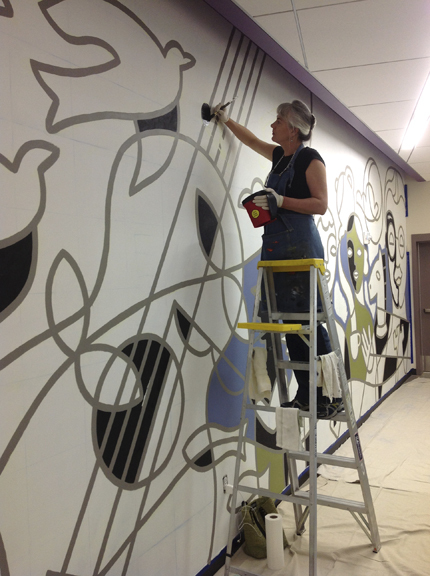 a mural at the Millcreek Senior Center in the Millcreek Community Center on Evergreen Avenue. I just finished painting the lines of the design and am thoroughly enjoying the process. The next step is painting in all of the colors.